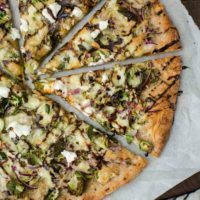 Brussels Sprout Pizza with Goat Cheese | Naturally.Brussels Sprout Pizza with Goat Cheese | Naturally. A fun and unique twist of pizza using Brussels sprout leaves, red onions, and goat cheese then finished with a balsamic drizzle! Preheat oven to 400˚F with a pizza stone on the lower rack. Trim the ends from the Brussels sprouts and remove the leaves, spreading them along with the core of the Brussels, out on a sheet tray covered with parchment. Drizzle with olive oil, salt, and pepper. Toss until the Brussels sprouts are well coated. Roast until leaves begin to crisp, 12 to 15 minutes. Increase the oven heat to 500˚F. On a surface lightly dusted with cornmeal, roll the pizza dough out until it’s roughly 1/4” thick. Brush with olive oil and top with 3/4 of the Brussels sprouts, onion, and shredded cheese. Bake for 10 to 12 minutes or until the crust is golden and the cheese has melted. While the pizza is baking, place the balsamic vinegar in a small sauce pan. Heat over medium heat until the vinegar has reduced by half, 8 to 10 minutes. Finish the pizza with the remaining Brussels sprouts, sprinkle of goat cheese, and a drizzle of the balsamic reduction. Tips & Tricks: If trying to save time, don’t pre-roast the Brussels sprouts. Spread the fresh leaves on the pizza. The leaves will still crisp! Look for premade pizza dough in the cooler or freezer section of your local grocery store.